Passover, oh how we remember… | Hipsters and Hassids: The painting series. The phenomenon. 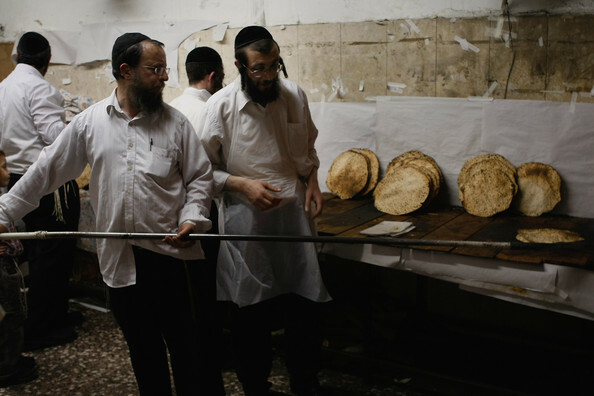 What do hipsters and matza have in common? They are both thin and baked. During my early days studying art at Pratt Institute a classmate living near Bedford Avenue leaned over and asked me, “Elke, why are the Jews burning food in the streets?” I calmly explained the Jewish tradition of burning the last bread-like items in your house before the start of Passover where no leaved bread is eaten to celebrate our liberation from slavery in Egypt. Passover is one of the most celebrated Jewish holidays that surpasses generations and all around the world. As much as it is the pillar story of our culture there are those who deny its existence, much like there are those who deny the Holocaust. I found this quote on the Jewish History Blog of Ben Gurion’s speech at the Peel Commission (during the British Mandate over Palestine) which made me realize how unique it is to have such a tradition as ours. “300 years ago, there came to the New World a boat, and its name was the Mayflower. The Mayflower’s landing on Plymouth Rock was one of the great historical events in the history of England and in the history of America. But I would like to ask any Englishman sitting here on the commission, what day did the Mayflower leave port? What date was it? I’d like to ask the Americans: do they know what date the Mayflower left port in England? How many people were on the boat? Who were their leaders? What kind of food did they eat on the boat? The seemingly silly rituals have been set in place to give our senses reminders of the redemption story. Even though most Jews live outside of Israel, the tradition is strong and there is never shame in celebrating freedom especially in the US. The celebrations are full of questions to get us to think and rise to new heights. Our neighbors, like my old classmate, are good to question. So get the questions rolling and think redemption, because the worst slavery is the one you don’t realize you are in. Translation mine from Ben Gurion’s autobiography.